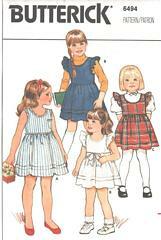 Out of print, old store stock Butterick pattern 6494 from the early 1980's in unused and mint condition. Dress or jumper, above mid-knee, has fitted, high-waist bodice with back button closing and slightly flared skirt with slit and one-way pleat. Optional armhole ruffle, patch pocket and hemline tuck. Purchased tops and ribbon belt.